My Life My Stories: Bukit Ruhiang Tamparuli Sabah. Bukit Ruhiang Tamparuli is a new place to visit here in Tamparuli. It is a suitable location to the the paragliding activities. Below is a special reports of Bukit Ruhiang Tamparuli. Bukit Ruhiang yang terletak di Tamparuli dikenal pasti sebagai antara lokasi yang amat sesuai untuk aktiviti meluncur udara atau Paragliding. Ini diakui sendiri oleh Pembantu Menteri Belia dan Sukan Negeri, Datuk Jahid Jahim yang juga Ahli Dewan Undangan Negeri ( ADUN) Tamparuli (Bekas Adun) selepas melakukan cubaan pertama meluncur udara atau Paragliding bersama ahli-ahli daripada Borneo Air Sport Ozone Adventures. Aktiviti meluncur udara itu diketuai oleh Kim Dong Sol dari Borneo Air Sport Ozone Adventures. Jahid berkata, aktiviti sukan atau riadah di udara masih belum diceburi secara meluas kerana sukan ini sememangnya amat mencabar dan berisiko. Kata Jahid sukan luncur udara itu menyeronokan kerana sesiapa saja boleh menikmati keindahan alam dengan melihatnya dari udara seperti burung terbang. 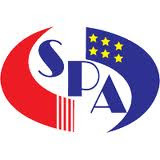 Luncur udara adalah merupakan sukan lasak yang bermula daripada tempat tinggi, melayang kemudian meluncur mengikut kelajuan angin. Namun kata Jahid meluncur udara ini memerlukan masa dan lokasi yang sesuai bagi membolehkan seseorang itu melayang di udara. Difahamkan pasukan Borneo Air Sport ozone Adventures melakukan latihan dengan memilih Bukit Ruhiang, Tamparuli. TAMPARULI (Sabah), 25 Jun (Bernama) -- Kementerian Pelancongan, Kebudayaan dan Alam Sekitar Sabah pada hari Jumaat meluluskan peruntukan permulaan RM20,000 untuk pembinaan anak tangga dari kaki Bukit Ruhiang di sini dalam usaha menggalakan industri pelancongan di negeri itu. Menterinya Datuk Masidi Manjun berkata walaupun peruntukan itu tidak mencukupi untuk membina anak tangga sehingga puncak bukit setinggi 1,000m itu namum ia akan menggalakan aktiviti rekreasi dan sukan extreme seperti luncur udara (paragliding) di atas bukit itu. "Sumbangan kecil ini adalah permulaan kepada pembangunan Bukit Ruhiang sebagai tempat tarikan pelancong. Ia juga akan memudahkan penduduk tempatan menikmati aktiviti riadah di sana. 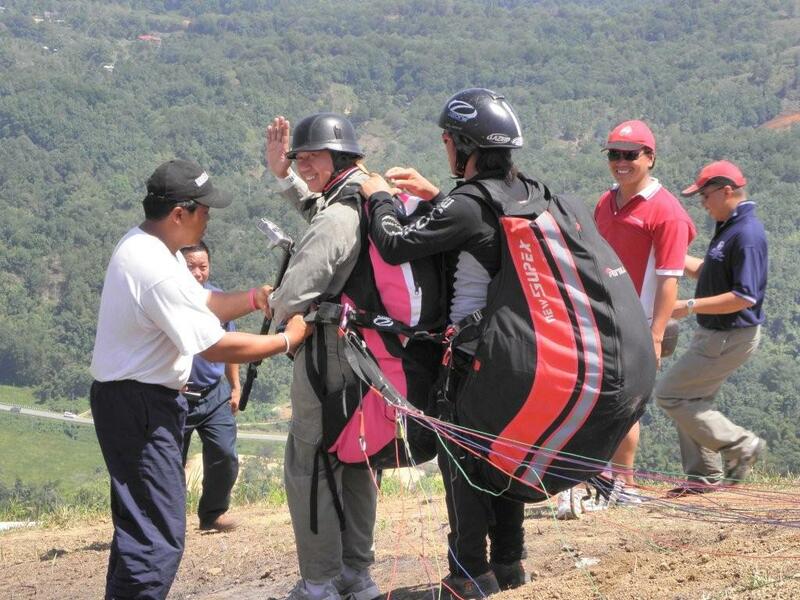 "Kerajaan sentiasa mencari jalan untuk membangunkan produk pelancongan dan rekreasi yang tidak memerlukan jumlah wang yang besar," katanya semasa melancarkan acara paragliding 'Sabah Malaysian Borneo Cross Country World Class' di sini. 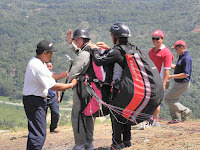 Sementara itu, Pembantu Menteri Belia dan Sukan Datuk Jahid Jahim, yang juga wakil rakyat Tramparuli, berkata acara paragliding selama tiga hari itu disertai oleh 13 negara. Tamparuli, a small village of several rows of wooden shops that has grown into a town of 37,000 people, is getting set to draw more tourists. Plans are afoot to have more tourist attractions in Tamparuli, which has hitherto been known for its weekly market on Wednesdays and the famous Jambatan Tamparuli song, and has seen tourists visiting the World Heritage Site in the Kinabalu National Park in Kundasang. Tamparuli State Assemblyman Jahid Jahim said the government proposed to develop several tourism products under the Ninth Malaysia Plan (2006-2010), including building the Rumah Kebudayaan Dusun Dusun Cultural Abode) and upgrading the Australian War Memorial Park, Bukit Ruhiang and Minangkob Waterfall sites. He said the Rumah Kebudayaan Dusun would popularize the culture of the Dusun ethnic community.We plan to have lodging houses for tourists who wish to spend the night there he told Bernama. Jahid, who is Assistant Minister of Youth and Sports, said the government would upgrade the War Memorial Park to draw more tourists from Australia. Bukit Ruhiang, located about 300 metres from Tamparuli, will be developed as a new tourist attraction for people who love extreme sports. We propose to build 1,000 steps to the peak of the hill from where the view is just fantastic. You can see the sea, river and the natural beauty around Tamparuli, he said. Jahid said the government was considering developing the Minangkob Waterfall which was popular with the local people but had yet to be fully developed. We will also try to make the Dusun Lotud cemetery in Kampung Bontoi near here a heritage site to enable the local community as well as tourists to see the unique graveyard of the ethnic community found only in the Tuaran district, he said. 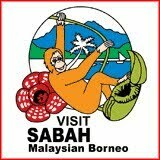 It is my desire to get all the new tourism products in Tamparuli into the Sabah tourism calendar, he said. Jahid said the tourism development in the area would indirectly upgrade the economic position of the local people. My objective is to develop tourism and agriculture apart from providing infrastructure facilities, he said. Jahid said the agricultural sector was given attention under the ninth development plan because 70 per cent of Tamparuli was most conducive for the activity, which could generate income for the villagers. One of the crops suitable for commercial cultivation is rubber. The income of rubber tappers is good as the price of rubber is stable. However, the tappers only work half a day. I hope to get them to cultivate other crops and breed freshwater fish,â€ he said. Efforts were also underway to supply electricity to seven villages, stretching from Kampung Kayangat to Kampung Tiong Monggis, which would benefit more than 2,000 people, he said. He also said that the government wanted to upgrade Sekolah Menengah Kebangsaan (SMK) Tamparuli and SMK Tenghilan to accommodate an increasing number of students. We will also set up a Kadazandusun school, the first of its kind in Sabah, in Tiong Monggis, Tenghilan, to ensure that the Kadazandusun language is not lost to history. We will be getting funds from the United Nations through a non-governmental organisation based in South Korea. The ground-breaking was performed last week and we hope to see the school coming up soon,â€ he said. Tuaran Member of Parliament Datuk Wilfred Madius Tanggau said he supported the efforts of Jahid and would work with him to develop Tamparuli. The state constituencies of Tamparuli, Kiulu and Sulaman come under the parliamentary constituency of Tuaran. 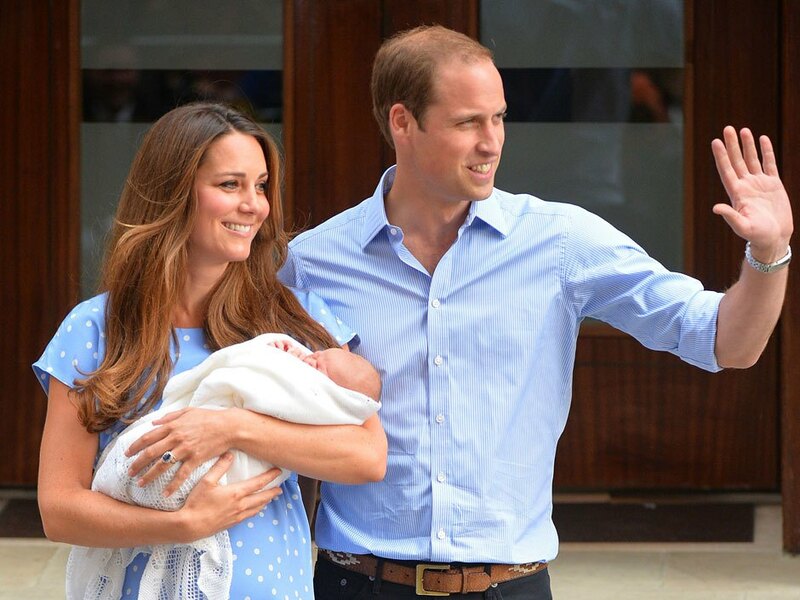 Glowing parents Prince William and Kate introduced their baby boy to the world Tuesday evening in London, carrying him outside St. Mary’s Hospital for photographers and cheering onlookers. Kate, wearing a bespoke blue polka dot dress by one of her go-to British designers, Jenny Packham, and signature wedges in cream, and William, in dark pants and his ubiquitous blue collared shirt, both took turns carrying the still-unnamed boy outside in the brief appearance. “He’s got quite the pair of lungs on him, he’s a big boy I can tell you that, he’s quite heavy,” Prince William said. Kate said little to the media, but William seemed relaxed and jovial. He laughed when a reporter asked him about the baby’s hair. “He’s got way more than me, thank God,” he quipped. 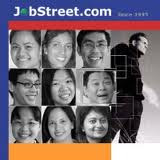 THE Kadazandusun Murut (KDM) communities do not have a written language of their own. Their stories or legends were passed down by words of mouth from generation to generation. They have many stories or legends about themselves, and in this article I want to write about the legend of the Bobohizan. We have just finished celebrating a very successful Tadau Kaamatan festival and witnessed Bobohizan from Tampasuk performing the Magavau ceremony. The Bobohizan (priest/priestess) are the group or the third institution of the Kadazandusun form of village governments in the old days. The first institution is the Orang Tua system and the second is the Village Elders (Council). The fourth institution was the Huguan Siou institution which is believed to be the last institution established and became prevalent during the Brunei Overlords. But the legend of the Bobohizan or religious group started with the first Kadazandusun Murut "mother" known as Suminundu. She was the wife of Kingaan the first ancestor. Kingaan and Suminundu came out from a boulder that had rolled down from Nabahu and settled at Tompios - known as Nunuk Ragang. They were semi-divine and had supernatural powers. Long after their passing to Hibabou (Heaven) the Bobohizan's prayers or incantations( Inaait or rinait in KD) were forgotten and got lost in the mist of time. But then, Suminundu sent down someone to earth to teach the people about the "rinait" or incantations of the Bobohizan. According to the story written by Rev. Fr. Anthonissan, the Rector of St. Michael's Church Penampang, during the Colonial days, he collected stories told to him by Kadazan elders of Penampang. One of these stories is about how a spirit sent from "Hibabou" to earth. The spirit came every evening and called on anyone who can hear to come forward. This call was repeated several months and later years but no one was brave enough to come forward to meet the spirit, until one brave woman went out to meet the spirit in the dark. The spirit told the woman that it was sent to earth from "Hibabou" to teach the Kadazan the "rinait" of the Bobohizan of the past. The spirit told the woman that she had to come and meet him every evening on the same spot until she learned the "rinait". Thus, it was that the "rinait" prayers was learnt by heart by a woman who in turn passed the "rinait" to other women in the village. According to the legend, as it was a woman who came to meet the spirit teacher, all Bobohizan in Penampang was therefore women only. Over a period of time, as the people in the district increased in numbers, the "rinait" tradition was made into two traditions. 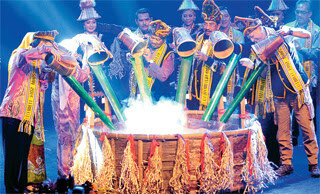 The first is known as the Kadazan tradition and the second is the Tangaah tradition. The "rinait" in both traditions are virtually the same including the procedures to be followed, but what differs is the type of clothing or attire they used. It is said that the Kadazan tradition and the Tangaah tradition both recite the creation of the world as part of their "rinait" but what differs is the type of canoes or perahu they used when transporting the spirit of the dead to cross the river to get to "Hibabou". The spirit of the dead apparently goes through seven hills, dales and rivers before reaching "Hibabou". 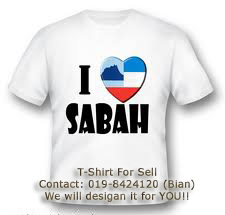 The Kadazan tradition is so called because this tradition used the term Kadazan in its "rinait". And Kadazan means "the people" and that this term was in used during the time of Kingaan and Suminundu in Nunuk Ragang. The Tangaah tradition meanwhile, although using the same language, refers to the "rinait" of that of the Tangaah tradition meaning the tribe called Tangaah of Penampang. The Bobohizan attire as well as the props used during the ceremony have been handed down to them from the ancestors who came from Taiwan and and to the Philippines. Based on the scientific test on the origin of the Kadazandusun people the attire of the Kadazandusun people, especially the Kadazandusun Bobohizan as well as the trinkets they used have come down from a tribe known as the "Inggorots" in the Philippines. And the origin of this tribe is from southern China. This scientific theory about the origin of the KDM is known as the "wave theory", because they travelled across the seas. There is a lot of custom and tradition associated with the attire and the props such as the swords, kombuongoh leaves and the headgear worn by the Bobohizan. The touching of this Bobohizan props especially the headgear was taboo tradition had it then that only the Bobohizan was allowed to touch these props, especially the headgears. Before it is worn in a ceremony, special "rinait" was conducted to appease the spirit. In time past, the newly arrived religious group such as the Christian clerics regarded the ceremony conducted by the Bobohizan during harvest festival (moginakan), planting, and also during a time when someone is sick in the village and the Bobohizan was called to conduct a ceremony to help the sick person recovers quickly from the influence of a bad spirit, the newly arrived religious clerics called the work of the Bobohizan as the work of the mammon. When Christianity became established firmly in Penampang over a long period of time, however, I remember replicas of the headgears worn by the Bobohizan were used during the Feast of Corpus Christi ( or Feast of Christ the King and Kadazan it was known as "Mamanau Kampung. It was so called because the procession went round the village. The procession started from the church and went round the village with the priest walking at centre stage under the specially built canopy. The canopy had four posters and four strong men carried the canopy. And accompanying the priest were boys and girls in fine uniforms. A group of young boys dressed in Kadazan costumes preceded the canopy and immediately ahead of the procession are four women dressed in Kadazan costume completely with the replica of the Bobohizan headgear. The "taboo" associated with the prohibition of touching the Bobohizan headgears seems forgotten. I asked about this and was told that replicas of the headgears were allowed to be worn by non-Bobohizan with the permission of the Bobohizan themselves. Perhaps the more cogent explanation is that most Kadazan in Penampang had converted to Christianity and even many of the Bobohizan also converted to Christianity. Today, young girls and boys performing at the Kaamatan Festival at the KDCA are seen using the replicas of the Bobohizan headgears. Some of the KDM elders have raised their eyebrows at seeing this apparent "blatant" disregard and disrespect of KDM's age-old custom and belief in respect of the Bobohizan props and headgears at public function. But I am told that there is no disrespect to tradition and custom intended. The intention is to show case the KDM fine and traditional costumes as more and more visitors from abroad are also guests at these public functions Each district has its own distinctive Bobohizan Magavau rituals. But the essence of the Magavau ceremony is shared by all suku or tribes - whether the Magavau tradition is conducted by Bobohizan from Tampasuk, Kota Belud, Tuaran, Matunggung, Papar or Penampang - and that is a call for Bambaazon, the spirit of Humindun, who has become the spirit of the padi to come and take part in the festivities. He people should harness the strength of ethnic diversity and unique cultural heritage to enhance unity, said Deputy Prime Minister Tan Sri Muhyiddin Yassin. He said people should not allow irresponsible groups to take advantage to create a conflict between the people and disrupt unity that was built over the years. "The prosperity and harmony among the people will prevail if cooperation between various races is nurtured. "Of late, our country is saddled with challenges than could threaten stability such as street protests which could lead to property damage and cause injuries to the detriment of the country and the people," he said when opening the Tadau Kaamatan Malaysia Open House, here, Sunday. Muhyiddin said the people should come together to protect and defend unity to sustain the good life, wellbeing and prosperity to enable the country to develop politically, economically, socially and culturally. "We should learn from what we have achieved in the past to enable us to lay a foundation for unity as a strong pillar that will take the nation towards a more progressive future," he said. On Tadau Kaamatan or the Sabah's Harvest Festival, he said the festival, which was steeped in tradition, should thrive as it contributed to the country's cultural diversity that could be shared in the march towards national integration. 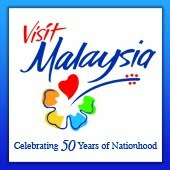 "Annual festivals like Tadau Kaamatan are not just for fun, but also to express gratitude for the blessings received," he said, adding that they also helped strengthen unity among the people and enhance Malaysia's image as a vibrant, interactive and dynamic tourist destination. Muhyiddin, who was accompanied by his wife, Puan Seri Noorainee Abdul Rahman witnessed 'mipulos', a traditional hand wrestling competition and visited various traditional houses. Present were Sabah Chief Minister Datuk Seri Musa Aman, Tourism and Culture Minister Datuk Seri Mohamed Nazri Abd Aziz and Deputy Chief Minister Tan Sri Joseph Pairin Kitingan, who is also Kadazandusun paramount chief. The audience was later entertained to traditional dances and songs by singer Jamal Abdillah and Jimmy Palikat, and a puppet show by WanRull Puppet. The Ministry of Domestic Trade, Consumerism and Cooperative has been urged to look into the shortage of diesel in the State Capital area since Saturday. 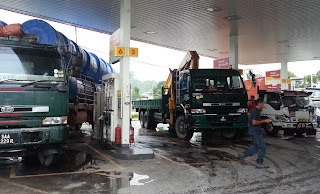 Sepanggar Member of Parliament Datuk Jumat Idris, who met several Bumiputera bus operators here, said there were claims that the diesel drumming system had been abused, resulting in the shortage. In this respect, he said the Ministry must investigate and monitor all companies that had been allocated with quota. 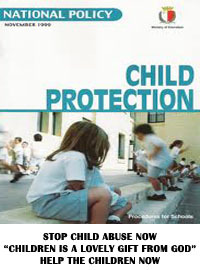 Perhaps, the Ministry needs to review the drumming system and improve it to prevent from abuse, he said. He also called on the Ministry to give assurance of ample diesel supply to the fishermen in Sepanggar and bus operators as well as the public. A similar situation had also been reported in Sandakan, which was also blamed on the drumming system.